Next time you head over to the companion website for this blog at theAPprofessor.org, you'll see a whole new website. Literally. The old website is enjoying a well-deserved rest on the beach of a sea of electrons, and a whole new—completely rebuilt—website has taken its place. Like rookie professors who replace veteran A&P professors, it still has a lot to learn. So I'm actively seeking your input on the kinds of things you'd like me to add or subtract from the website. Either comment on this blog post, or use the CONTACT form on the website. This new version of The A&P Professor retains a few of the design elements of the old one, like the Hip Logo. However, the website design is now "responsive" to allow resizing and rearrangement of page elements for easy viewing on any device—from desktop to pad to phone. I did a lot of pruning during the rebuild of The A&P Professor . I removed dated topics and book reviews, and the curated lists of websites and images. The latter just got out of hand for one guy with several "real" jobs, plus tending to a bunch of websites and blogs and a daily newsletter. When I started curating those collections, it was hard to find what we needed to teach A&P successfully—but now it's now much easier to find what you want on your own. The new website is now closely linked to another of my websites, the Lion Den. The Lion Den has also recently been rebuilt to focus entirely on the teaching and learning of human anatomy and physiology. 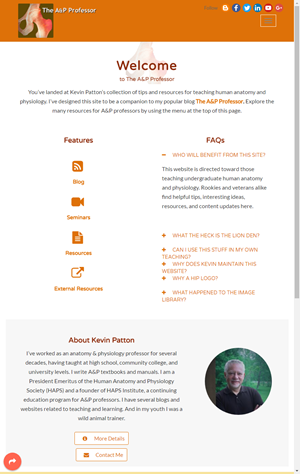 So check out the Lion Den offerings as you explore the new The A&P Professor website! As always, I continue to appreciate your support!